Today I received the proofs for my latest, greatest risk—my novel. All around me, I see, hear, and feel people whimpering as they stand with their toes on the very edge of the unknown. The changes in the world are rippling down to each one of us, shaking many of us out of our routines, cracking the foundations of old institutions and careers we thought were forever. Our first instinct is to hide. When I was in elementary school, my classmates and I were drilled in how to climb beneath our wooden desks with our arms over our heads to shield ourselves from nuclear attack. What? Even then, it seemed stupid, but it was something to do, I suppose. Hiding is over-rated as a strategy. Trouble seeks each of us out. When my husband and I had horses, birds often chose the space above their stalls in the barn as a safe location for a nest. 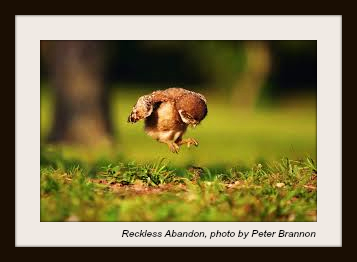 However, when the baby birds leaped to the ground, they were no longer safe. The horses couldn’t see them well enough. So what do you do when you find yourself out of the nest? Move! One baby bird managed to flutter up to a wooden rung. She eventually strengthened her wings enough to continue her life. The other became the brown spots between my horse’s toes. When I look at the business side of marketing my writing, I want to sit in a corner and pull a blanket over my head. This isn’t what I trained for during all those hours I spent writing and writing and writing. Many authors give up. “You can’t make a living writing!” we’re told over and over. And that’s often true—certainly true for anyone who surrenders. If you find you have to learn new skills, at least you know learning new skills is a great way to build and nourish your brain. You’ll stay younger (honestly!). People are designed to struggle. Once you’re too comfortable, you’re withering, whether you know it or not. Stop listening to your “advisors.” Listen to your gut feelings, your instincts. What draws you? What kinds of challenges make your heart beat a little faster? What do you care about? Like to do? Give up telling yourself why you can’t do something and figure out how to do it, anyway. Your way up doesn’t have to be pretty. You’ve heard the fantastic stories of success by those who refused to be defeated. If writing isn’t truly my next step, I’ll know soon enough. But I’ll keep looking for a rung up until my instinct tells me to move again. Don’t wait to be crushed. Don’t allow yourself to be a victim of life. Yeah! Glad you’re one step closer to publication. Stepping off the ledge is hard but how else are you going to learn to fly? Your wonderful book makes a good model to follow! This entry was posted on April 19, 2015 by Personal Journeys with Gramma in Musings and tagged Being Too Comfortable, Change, featured, Insticts, Learning, Listening to Instincts, Moving On, Musings, New Adventures, New Paths, New Skills, Nourish Your Brain, Risk, Struggles, Success, Taking Risks.